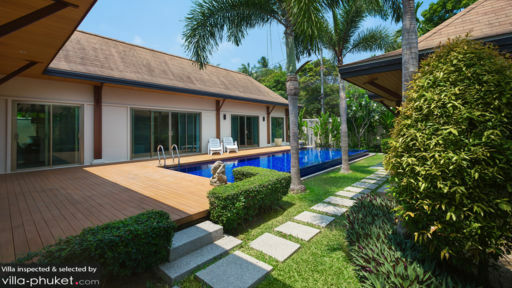 Villa Hatiti is a three bedroom tropical getaway perfect for families looking to be close to Thailand’s beaches while having their own private space. Nai Harn Beach, one of the area’s more popular beaches amongst locals, is only a three minute drive away. Aside from its proximity to the beach, the villa has friendly staff, a clean and spacious living area, and a 10 meter swimming pool set in a lush green garden. Come and visit Villa Hatiti if you want a quiet tropical getaway near the beach that you, your family, and friends can enjoy. The villa has three guest bedrooms, which are calming spaces perfect for couples to relax in. It has a master suite that is bright and airy, with sliding doors that open up to the pool and garden area. The room is equipped with a king sized bed and an en suite bathroom and tub. The other two bedrooms also have king size beds and en suite bathrooms. Bright green grass surrounds the picturesque blue 10 meter swimming pool, where the sunlight glistens off its enticing waters. 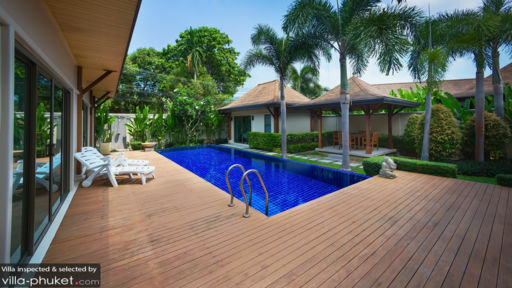 You can either take a swim or relax by the wooden pool deck on one of the two loungers. After swimming, have a meal in the outdoor dining area under the gazebo. In the evenings, enjoy a barbecue party with the rest of the family. 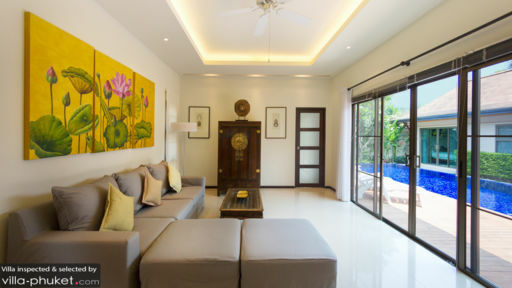 Villa Hatiti’s open plan living space has white washed walls and beautiful Asian furnishings. You can sink into the L-shaped sofa and admire the view of the garden and pool. On lazy days, you can watch a show on the LCD TV. A few steps away from the lounge is the villa’s indoor dining area that seats six people. Next to the dining area is the fully equipped kitchen where you and your family can cook meals together that you’ll enjoy during your stay. The staff here at Villa Hatiti will make sure that your holiday getaway is comfortable and memorable. Some of the services include: a personal concierge, WIFI, and recommendations of what to do around the area. Housekeeping will also ensure that the space stays clean and pleasant during your stay. You will be introduced to Thai hospitality here at Villa Hatiti. Villa Hatiti is located in a private villa compound in Phuket, Thailand. This quiet area is situated only a three minute drive away from Nai Harn Beach, popular amongst locals. There are a few hotels near the beach where you can grab drinks and watch the sunset from. You can also eat in one of the restaurants nearby. There are also a few snorkelling haunts near Nai Harn Beach that guests can visit. However, if you’re looking for a place to visit not too far from the villa you have a few options. Within three minutes walking distance of the villa are a number of restaurants offering various cuisines. In 600 meters, you can also go to a Family Mart, massage area, and gym.